I have always loved to read. I can remember being excited about starting first grade because FINALLY I'd learn to read for myself. I was one of those kids who took to reading like a duck to water; once it "clicked" a few weeks into the school year I was off and running and way ahead of my classmates. I was reading chapter books by Carolyn Haywood by the end of year and I never looked back. We were in Turkey at that time and didn't have a TV so that meant if I wanted escapist entertainment, it was coming from print, not a screen. Most towns have one, and if yours does not, a nearby town will probably let you use theirs even if there is a yearly fee. 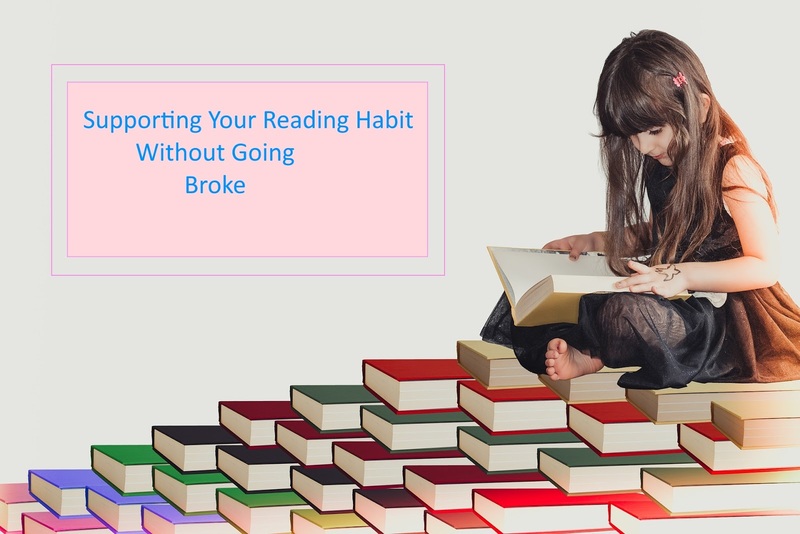 While the number, quality and variety of books available depends on the system, generally you can find something to read at the library even if you are on the waiting list for the latest best-seller. One big recent change for public libraries is that many now provide e-books that can be downloaded and read on your tablet or Kindle. My library uses Overdrive and many of the books are borrowed from Amazon. One thing many libraries (or their Friends of the Library club) do is sell discarded library books or donated books the library does not want to keep. You get to provide money to update the library while obtaining books you can keep at a low cost. Little Free Libraries are boxes built by individuals or groups that provide shelter for books people want to swap or give away. The operate on the idea of leaving a book when you take a book. You can find one near you here. The major ebook sites like Amazon and Google Books offer free books constantly. Some are permanently free--authors will offer the first book in a series at no cost to hook you into the series, hoping you will pay for successive books. Others are backlist offerings from authors hoping to entice you to buy their current, often new, books. The classics are also often free. Websites like Bookmooch allow you to swap unwanted books for books you want to have. Instead of using money to purchase books, you use points. When you join Bookmooch, you a point for entering your list of giveaway books. With that point, you can "mooch" a book from someone else's list. Each book someone "mooches" earns you a point; each book you receive from someone costs you a point. Users pay to mail books to the recipients, and since books can be send via media mail, the per item cost is about $2.50. One big advantage of book swap sites is that they allow you to de-clutter as you go; saving someone the hassle of dealing with it after you are too old to do so. Book Bloggers are bloggers who write about books, and publishers make review copies available to many bloggers. The best way to learn about book blogging is by reading book blogs, and you can find a lot of them by clicking through to the bloggers who link up on memes like Mailbox Monday or It's Monday, What Are You Reading. Those meme posts will also give you an idea of where bloggers and getting their review books. Some publishers have review programs and there are tour groups out there but today, most review books are distributed in ebook form via NetGalley and Edelweiss. Bloggers register, and then request desired books. Publishers decide whether or not to approve based on a number of factors including past history with the blogger. To get started as a book blogger, write reviews of what you are reading, whether a purchased book or a library book. After you have been writing for a couple of months, register with NetGalley and Edelweiss and then start requesting books. What are your favorite free or inexpensive sources of reading material? I wrote this last year and since it is all still true (and I have stuff to do to get ready for Christmas) I'm just re-posting. If you read personal finance blogs, you've noticed a lot of posts lately about thrifty gift giving; and ideas range from homemade gifts, to IOUs for services, to garage sale finds. My list is going to be gifts that money can't buy. Money can't buy family or their love, and without them, life would be so empty. Thank you God for the gift of my family. "St. Cecilia's Roman Catholic Church (Greenpoint, Brooklyn)". Licensed under CC BY 2.5 via Wikipedia. Money can't buy faith; and without it there is no long-term hope. Thank you God for the gift of faith in You. Money can't buy the beauty in nature. 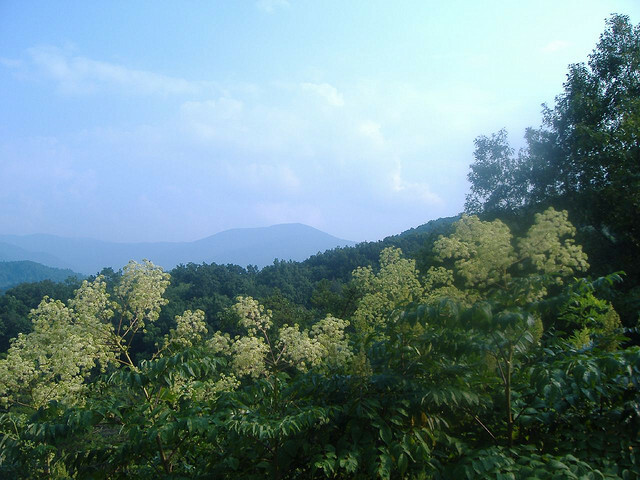 Yes, it may cost money to go and see places far from home, but most of us live close to natural beauty, beauty we may not even notice because to us it is so normal. 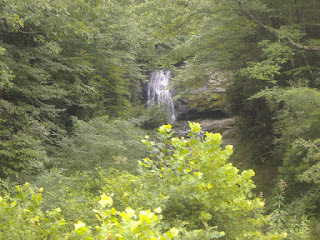 Thank you Lord for the beauty of the earth You made. Money can't buy peace. It can buy weapons, it can support armies, and the lack of it can make men easy pickings for terrorists, but money can't buy peace, either worldwide or within our homes and hearts. Please God, grant us peace. May the Joy of Christmas be with you and you loved ones now and forever. God Bless each of you--you are another thing money can't buy--readers for a blog! The new year often bring with it resolutions to improve your life in one way or another. 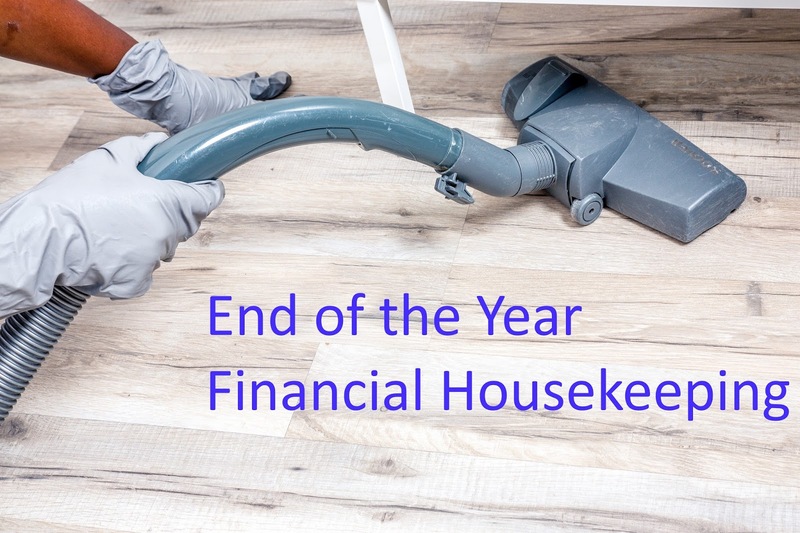 As we reach the end of 2017, it is time for some financial housekeeping. Time to open the drawers and cabinets, pull things out, take a look at them, decide if they are worth keeping and buff them up and put them away again if they are worth keeping--and just as we may have to help the elderly members of our family with major cleanings, we may need to help them organize their finances as well. One day you won't be here anymore, and until it happens (or it is close) you won't know whether you are one of those who gets at least a few weeks warning, or whether you will pass suddenly, or at least be incapacitated suddenly. List of professionals with whom you deal, particularly if your children/heirs are out-of-town. Include accountant, attorney, plumber, exterminator, HVAC repair or anyone else they may need to contact before the estate is closed. Your most recent tax return. Your executor will need to prepare your final tax return, or have it prepared, and having last year's return as a starting place is a big help. Your IRAs, 401(k)s and life insurance policies are not passed to heirs via your will but via a beneficiary selection form completed when the account was opened or the policy purchased. If you haven't looked at your forms lately, now is a good time to make sure you haven't disinherited your youngest, and that you aren't leaving a windfall to your ex. Putting copies of these forms in your binder will help your executor when the time comes, and then next year you can quickly review the binder and make sure the forms still reflect your wishes. Many people believe that the "insurance check-up" offered by our friendly agent is little more than a push for us to buy more insurance, and indeed that may be exactly what it is. However, as we go through life, our insurance needs do change and sitting down once a year to review your coverages is a good idea. Life Insurance: Has anything changed in your life to make more or less life insurance a good idea? If your youngest just graduated from college, do you still need that big policy? If you just bought a big house and a baby is on the way, it is time for more life insurance. If you are making substantially more than you were when you bought your policy, you may need more insurance to protect your family's increased standard of living. Health Insurance: Open enrollment for health insurance is generally around this time of year. If your employer doesn't offer a choice of plans, the choice may be simple but if you are offered various networks and deductibles now is the time to run the numbers and see what will likely work best for you. At some point most people acquire some sort of ill that requires periodic doctor visits and once that happens the high-deductible plan that has served you well for years may not be the best plan for you anymore--or it may be. Run the numbers. Auto Insurance: If your car is financed your lender will require comprehensive and collision insurance. However, once it is paid for, you get to decide whether those coverages are worth it. Basically the lower the book value of the car, the less you have to gain by carrying comprehensive and collision insurance. If it would not be a financial hardship for you to go out right now and buy another of whatever you are driving, it is time to seriously consider dropping the comprehensive and collision. Paying $300 per year to avoid having to pay $2,000 just doesn't make economic sense. Also, look at your liability limits. As your income and assets rise, so should your liability limits. Most middle income families with assets and an income that allows for extras like vacations, boats, or private schools should have at least $100,000 in liability coverage. On the other hand, people with a low income and few assets can get by the the state minimum. Homeowners/Renters: Homeowners insurance pays to repair or rebuild your home if it is damaged in a covered peril. It also replaces contents damaged in a covered peril (usually fire, theft, wind, or hail). Flood insurance is separate. Take a yearly look at your limits and decide whether it is time to raise them. In some places the average cost of homes has skyrocketed not because it costs that much more to build but because the land has become very desirable. If you have a fire, you don't have to replace the land, only the house so find out if you have enough insurance to rebuild. One way to control the cost of homeowners insurance is to raise your deductible. If you can afford the out-of-pocket expense in the case of an incident, then you may want to consider this. If you are like me, you have a 401(k), an IRA, a Roth IRA, and your spouse has the same, and then there may be a taxable account or two lying around too, plus the money in the bank, and that credit union account that your dad told you to keep open because it is such a great place to borrow money. How often do you sit down and look at all those accounts as a whole? Personal Capital is an online robo-advisor that allows anyone to set up an account and link all their bank accounts and investment accounts, without cost. 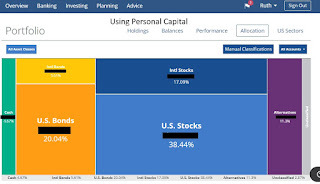 Personal Capital will then analyze all your investments and see if your overall asset allocation is in line with your goals, as expressed in a survey they administer. Once everything is in there, a quick check will tell you what your allocation should be, and what it is, so you can make needed changes. If you have only a few accounts you can check them manually, and you should do so at least yearly, to re-balance. For example, the general rule for people my age is to have about 65% of your assets in stocks, about 35% in bonds. If I had started the year with that allocation and all my deposits this year had been made according to that ratio, I'd be overweight on stocks right (unless I had made some awful choices in picking stocks/funds) because the market has gone up so much. Most retirement plans let you move money between funds online, and some let you do it via phone. 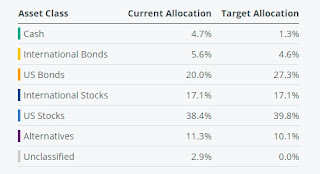 The other thing you need to do periodically is to determine if your current asset allocation is still appropriate. In general, as you get older, more of your money should be invested in bonds rather than stocks. 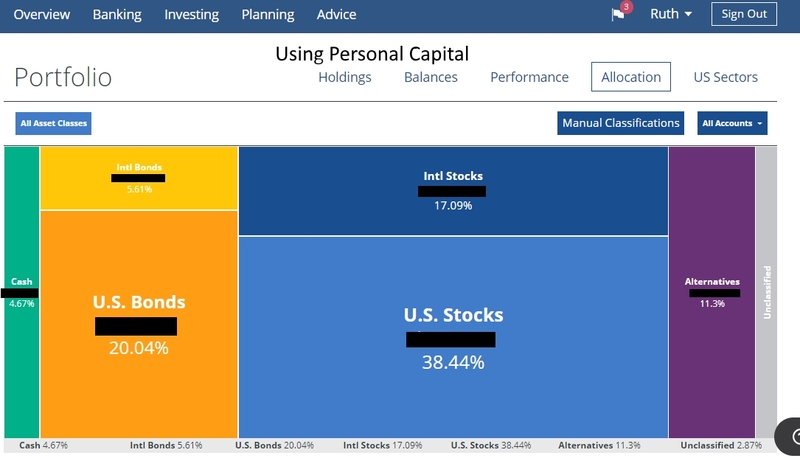 Most mutual fund companies and robo-advisors have online quizzes you can take to help you determine what your asset allocation should be. Once a year, take it out and read it. Is it still appropriate? Do you have a living will or advance directive? Do you want one? If the document you have still expresses your wishes you can put it away for another year, but if your family has changed, or your wishes have changed, call an attorney and get the will re-done. Many companies give raises or bonuses in January so the beginning of the year is a good time to consider your budget and your goals. Sit down with your spouse or significant other if you have one and consider where you need to spend more or less in the coming year, and what you want long-term. Keeping up with your finances is a lot like housekeeping; if you keep the clutter picked up on a regular basis and tackle the bigger chores a few at a time, it is easier than cleaning a pigsty from top to bottom. A yearly "deep cleaning" makes sure nothing is missed but regular light maintenance makes that deep cleaning easy. There is no question about it; Bitcoin is hot. There are those who are predicting it will go through the roof and make those who have invested in it rich, but I'm not buying any. Why? Bitcoin is a currency not backed by any government that some people or companies accept as a medium of exchange. Unlike currencies backed by governments, Bitcoin does not have a physical form, it exists only in "bits" in pieces of information on computers. The Bitcoin network is decentralized and interconnected--there are lots of computers with the same information on them. That's the fifty cent summary of a New York Times article, but the bottom line is, I really don't understand it. Like anything else, you buy them. You can buy them through companies that require indentification and in ways that do not. For some reason, drug dealers like the ways that do not. I have no idea how much of the money you give these companies goes into currency vs how much is fee or profit for the company. How Do You Make Money with Bitcoins? You make money with Bitcoins by selling them for more than you paid for them. In some ways, all currencies are subject to the law of supply and demand, though usually we see it on the side of a good or service that is purchased as opposed to the currency side. Last year $10 purchased a widget; this year $10 only purchases 90% of a widget. We say the price of the widget has increased--and if doohickeys and thing-a-ma-jigs are the same price they were last year, then yes, widgets cost more, but if "everything" has gone up 10% then in reality the currency is worth less. If you want to buy Bitcoins you have to pay what those possessing them are charging. If you want to sell them, you only get what people are willing to pay. How that is determined is something I do not know. 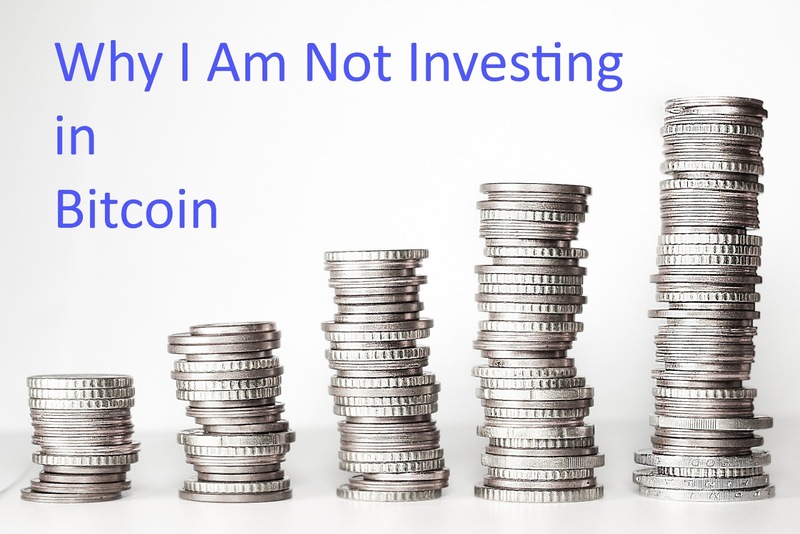 So, Why Am I Not Investing in Bitcoin? If you read each of the paragraphs above, you'll see why I am not investing in Bitcoin--"I do not know" "I have no idea" "I really don't understand it". I'm not saying I'll never invest in Bitcoin--maybe one day I'll do the research and understand those things and feel comfortable investing. However, someone once told me that if I wanted to invest in something, I should be able to tell you what it is I am buying, how I expect to make money from it, how I could lose money from it, and why, and who is making money because I'm buying it (and how they are paid). If I don't know those things, then my "investing" is really gambling--it might work, it might not but I'll have no way of duplicating the success or avoiding the problems in the future. In other words, I am counting on getting lucky, nothing more, nothing less. Bottom line--if you don't understand it, you shouldn't invest in it. It doesn't take much web surfing or blog reading to learn that Stich Fix is a hot property. They recently went public and though they did not raise as much money as hoped, their stock price is up. For the uninformed, Stich Fix is a clothing subscription service. Customers fill out an online survey and then, periodically (frequency depends on the plan chosen) they are sent a box of five clothing items and/or accessories which they try on in the privacy of their own home where they can see if the pieces go with other things in their wardrobe and where they are not being pressured by sales people. The box includes a mailer for returning unwanted items and a $20 "styling fee" is applied to any purchase made. Stitch Fix has combined data analysis and a flair for fashion to make it easy for people who hate to shop to update their wardrobes and to give even those who do love to shop a chance to try something they might not have picked. I've never tried Stich Fix though I've read reviews online. 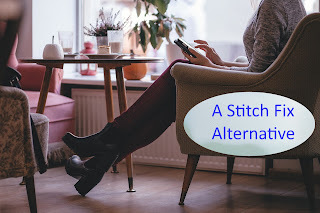 I have tried a competitor, Dia & Co., which does pretty much the same thing, except that Dia &Co is for plus-sized women, a market Stich Fix has just begun to serve. 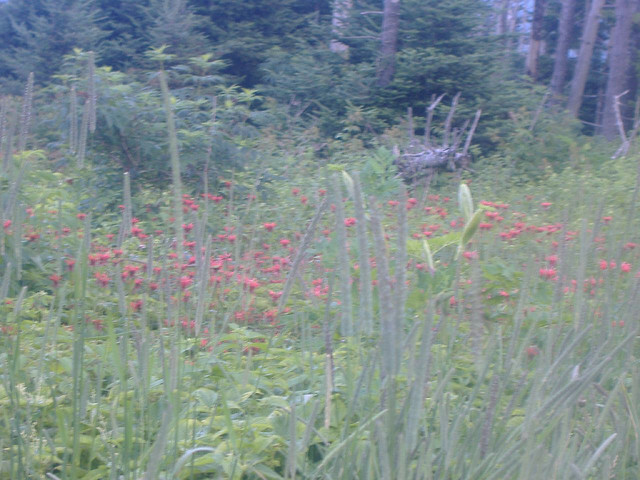 I wrote about one box on my book blog, and another box here. What Are the Plusses and Minuses? It is fun to get stuff in the mail. Even in this day of one-click ordering from Amazon, there is still something fun about coming home to a package with your name on it, especially if you aren't quite sure what is in it. Trying things on at home, with your other clothes is more helpful than trying them on in a dressing room, in isolation from the rest of your wardrobe. If it looks awful on you, you aren't going to want it in any case, but if it looks good, it would be helpful to know if it matches your gray pants or the blue sweater. Yes, you can always return things, but will you? The box can encourage you to try things you might not otherwise have given a second look. One of my favorite Dia &Co. purchases is a dress I would never have tried on because it was too expensive and that style doesn't look good on me. Those boxes are expensive. If you regularly walk into mid-priced department stores (Dillards, Macys) and buy non-sales price merchandise, then these boxes will be in your spending niche. For those of us who shop the sale racks or lower priced stores, the prices of $50 or more per item seem high. Is There a Lower-Priced Alternative to Stitch Fix or Dia & Co.? If you are looking for a subscripton box that costs substantially less than those two, well, I haven't found it. While I'm sure computers do most of the work, reality is that someone is picking the clothes, putting them in a box and sending them to you, along with a cute little note. While I doubt stylists spend a tremendous amount of time on any one box, the cost for them, plus packaging and two way mailing means, I suspect, that this business model wouldn't work with lower-priced clothing. Decide ahead of time on an amount of money or number of items and then go to your favorite store's website and order them. Hopefully your favorite store has a website and accepts returns either in the mail or in-store. Dress Barn is my favorite store and my last Dia Box came in at $300, so I went to Dress Barn's site and picked out $300 worth of clothes in my sizes--and was able to get closer to ten items than the five Dia &Co. sent me. They showed up a few days later and I tried them on. I kept two and stopped by my favorite store a couple of days later and returned the rejects (and picked up something else while I was there). The main advantage to this method is that you don't get things you absolutely wouldn't wear--no tulle skirts or distressed jeans for me, I'm in my 50s, I'm not 5 or 15. The disadvantage is that there is no one pushing you to trying something you wouldn't ordinary try. You could remedy that by some version of digitally throwing darts and ordering what you land on, even if it is a tulle skirt (shudder). Give someone you know your account information for the store website. Unless it is somone you really trust with your money, don't give them the credit card information but let them log onto the site as you, and fill your cart with a specified number of items or amount of money. Give that person your sizes too. Once the cart is full, you log on and pay (and decide whether or not to peek). A friend who really "gets" you and has great sense of fashion could both avoid the tulle skirt and find the vest you'd never look at twice--but which looks great on you and goes with half your wardrobe. Clothing subscription boxes can be fun, but they are an expensive way to build a wardrobe. Consider alternatives for at least part of the fun for a lot less money. However, if you want to give Dia &Co. a try, use this link and I get a referral fee. Blogging is one of those things you can do as a hobby or as a job. 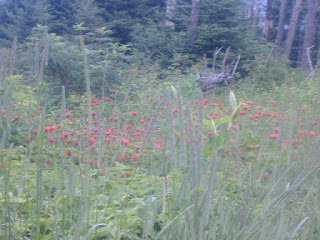 Those for whom it is a hobby blog to connect with those of similar interests or as an outlet for creative expression. Those who do it as a job want to make money. There are even some of us who blog mostly as a hobby but who wouldn't mind making money. 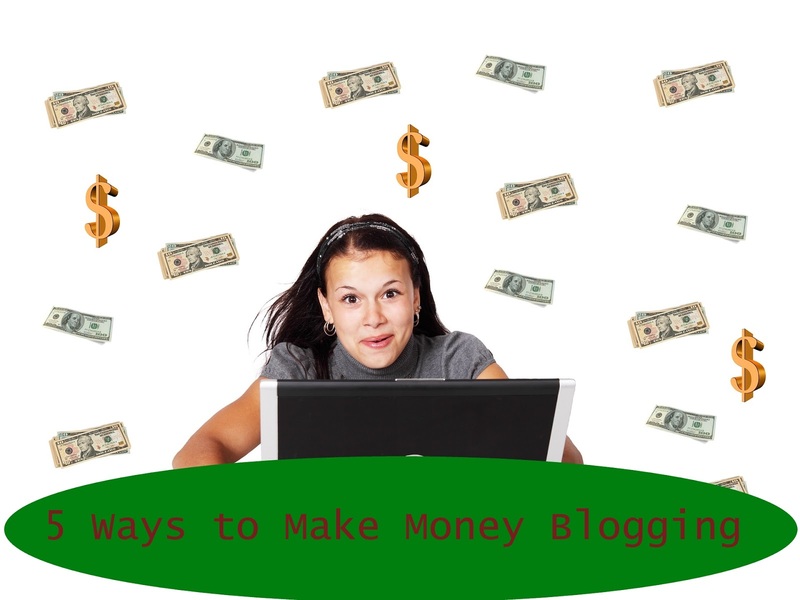 That leads to the question: How can bloggers make money? Like the owners of any other medium, bloggers can make money by selling advertising on their site. Some are able to cut deals directly with advertisers for space; others belong to networks like Adsense which place the ads and pay the blog owners. Sponsored posts are posts an advertiser pays you to write, like this one was intended to be. (I sent a copy of the article to the client for review and payment prior to publishing and never heard back from them) Usually bloggers are asked to write a post that fits with the theme of the blog, and to mention the client a certain number of times, and to use the provided links. Mel wrote a great post that mentioned programs that match bloggers with companies that want sponsored posts. A lot of businesses will pay a sales commission or provide things of value to bloggers who refer new business to them. One such business is Amazon. Associates are given codes which are integrated into the URLs of products on Amazon's website. Bloggers write posts that suggest the purchase of the products or advertise the products on their sidebars. If a reader clicks the link and buys from Amazon, the blogger gets a commission. As with many other commission-based sales programs, the more you sell, the higher the commission rate. At one time becoming an Amazon Affiliate was as easy as filling out an application. Recently Amazon has cracked down on what they consider to be spammy websites. Also, they require that affiliates sell something within the first six months. If you are approved, Amazon offers a variety of products and its links are easy to include in posts. I had been an Amazon Affiliate until my state's tax laws disagreed with Amazon and Amazon dropped all residents of my state. Amazon has since agreed to collect sales taxes and while Louisiana residents can now become Amazon Affiliates, my most recent application was turned down. Motif: This stockbroker sell baskets of stocks, which it calls "Motifs" for $9.95 per basket. Use this link to get a free 3-month trial of Motif, a smart way to invest for people who care. Motif makes it easy to build an investment portfolio that aligns your financial goals with your personal values. With this free trial, you will get access to their Impact accounts as well as their powerful trading tools. Stockpile: Stockpile is an online stockbroker which charges a flat $0.99 fee per trade, and which sells fractional shares of stock. If you are looking for a different type of Christmas present this year, Stockpile offers accounts for minors which allow them to buy and sell stock, subject to your approval. If you use this link, you get $5.00 worth of stock to begin your account with them, and I get $5.00 too. I wrote a full review of Stockpile a few months ago. Robinhood: Robinhood is a commission-free stockbroker which, at this time, can only be used via smartphone (they are in to process of developing a website). If you use this link to open an account with them, you and I will both receive a free share of stock. Here is a link to my review of Robinhood. Ibotta: Ibotta is a smartphone app that offers you coupons and tracks your purchases. I just downloaded it so I can't tell you a lot about it except that if you use my link, you get $10 and I get a reward as well. Some bloggers make money by developing and selling a product such as an e-book, or in the case of some really big names (think Pioneer Woman) actual physical products. Other bloggers use their blogs as a way to publicize an ongoing business. From what I can see, most of the bloggers who are making big money from their blog are doing it by selling products. Some companies will offer complimentary products to bloggers who agree to review them. This is especially prevalent in the worlds of book blogging and mommy blogging. While some products are given with the understanding that they will not be sold (like review copies of books), and some will be consumed in order to review them, still others can be sold by bloggers or given as gifts. Blogs with large readerships generally qualify for more and better review products. Some can be obtained through tour groups and sometimes company publicists will respond favorably to a request for a review product or even a giveaway product --and giveaways can be a great way to increase readership if you are willing to promote them. Have you found any ways to make money blogging that I have failed to mention? 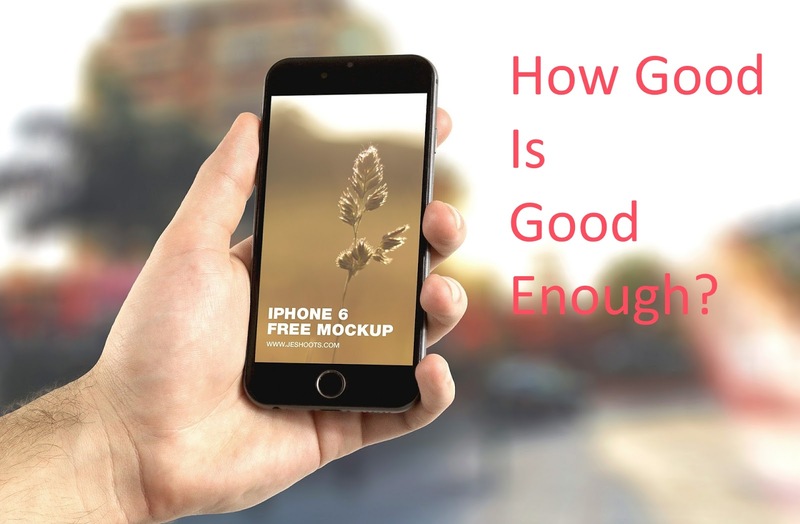 I'm sort of in the market for two things that make me wonder "How Good is Good Enough?". My phone is a 5+ year old "Blackberry"-style dumb phone. It makes and receives calls and texts and my bill from Tracfone averages about $10 per month. It really does what I need it to do, at least most of the time. However, I realize that it isn't going to last forever, and every now and then I start thinking about getting a smart phone. The question is how much to spend? At what point am I buying power that I will never use (or at least will never miss if I never buy it in the first place) and at what point am I buying a piece of junk that will have to be replaced sooner rather than later after frustrating me it's entire life? What Do I Want in a Phone? I know it sounds silly, but I want something that will make and receive calls and texts. I also want a decent camera, since another broken device here is my digital camera. We are taking the Girl Scouts to New York this summer and I want to be able to take pictures, post them online and have the quality be good enough that I can print them if desired. I want to be able to read my email and surf facebook, and it would be nice if the keyboard was easy to type on so I could reply, but for any substantial typing I prefer a real computer with a real keyboard. While I don't plan on using it for extensive web surfing, I do want searching the internet for something to work reasonably well. I want it to run a few apps like Robinhood and I'd like one that can link to a Fit Bit or similar device. What Do I Not Need? Downloading a lot of music. Music just isn't my thing. I listen to some but I can almost guarantee you that no matter what phone I have, I won't be downloading lots of songs and arranging them into playlists. Listening to podcasts: Talk radio is annoying; amatures doing talk radio is even worse IMO. Watching videos: Not my thing to begin with, but if I was going to it, I'd use my Kindle Fire. Reading books: Love to read; that's why I have a Kindle Fire. I may read on my phone if I'm desperate, but hopefully I won't be. I can afford to buy the latest I-Phone, if I wanted to. However, I suspect that I wouldn't get my money's worth. I have found that the easiest way to save money is to buy products that meet my needs/wants, rather than other people's. So, how much should my new phone cost? Are there any brands I should avoid? Right now, Tracfone is selling smart phones for as low as $20.00 and as much as $530.00. All are Android phones. Will I be happy with a $20.00 phone? How about the $80? Anybody have any advice? The other thing I'm looking at is a sewing machine. My current machine is an early-'80's White. It sews straight stitches, zig-zag and a dozen decorative stitches I've never used. Someone gave the machine to my father-in-law, who gave it to me. I used that machine to make maternity clothes when I was pregnant with my now-25 year old, and to make the comforter, bumper pads and curtains for my nursery. I've hemmed school uniforms, sewn on scout patches and done a little mending over the years. A couple of weeks ago I was hemming a shower curtain to turn it into a window curtain and something went wrong. I think the timing is off, but I don't know enough about sewing machines to know for sure. This machine is not used often nor do I do complicated things with it. However, it is nice to have so I made a couple of calls about getting it fixed. I'm basically looking at about $100. With that in mind, I started looking at new machines and found they ranged in price from about $75 to several thousand dollars. I'm not going to spend several thousand dollars, but how much should I spend? How much is enough? I posted on a couple of sub-Reddits, and the advice I got was to fix the old machine--that a $100 machine was junk. Ok, that's what I'll probably do, but if I was in the market for a new one, how much is enough? "You get what you pay for" is a favorite adage of those in sales. The granite counter top will last much longer than the formica (but I've seen enough harvest gold formica to know that formica lasts longer than I am going to want the same counter tops). The new car will be better than the old (but you can buy a lot of car repairs for the price of a car payment). The clothes from Saks will last longer than the ones from Wal-Mart (but who wants to wear clothes more than a couple of years anyway?). My son needed a new mattress about a year ago. We had paid good money for the one he was using but it did not hold up. About that time I read this review on Frugalwoods and decided to give this mattress a try. A year later when my daughter complained about her mattress, I ordered one for her. Next time someone in my house needs a mattress, it will be delivered by Amazon as well. I have no reason NOT to buy the cheap one from them. At least at this point, I see no value added by a more expensive mattress. Any suggestions as to price range for phones? Anybody want to chime in on fix the sewing machine vs buying a new one, or does anyone want to tell me the price range I should be considering for a sewing machine that is an occasionally used toy as opposed to a workhorse? Do you have any stories about picking an inexpensive model and finding out that you made the right choice, like I did with the mattresses? What about a purchase you made where you could have afforded to pay more than you did--and after getting the product you wished you had? After I wrote this post and before I published it Cyber Monday appeared and I bought a $92 phone that came with 1,000 minutes of talk, 1,000 texts, 1000 MB of data and six months of service. It is the same phone my daughter bought a year ago for $200.00 and she says she likes it. Also last weekend I was wrapping gifts at Barnes & Noble with the Girl Scouts and one of our customers was a seamstress (I don't remember how we started talking about that) and so I asked her what she thought about sewing machines. She said to fix the old one. I don't think my family is abnormal in having my 401(k) with one brokerage house, my husband's with another, and our IRAs in multiple accounts with yet another company. Throw in a couple of accounts we have for my entertainment, and keeping track of how much we have overall and how it is distributed can be time-consuming. Personal Capital allows you to link all your investment accounts. Most can be set to automatically update both the number of shares and the price per share. We can do this with our accounts at MFS, Motif, Vanguard, Lending Club, and Prosper. For these accounts, new purchases, dividends and exchanges are all automatically updated on Personal Capital. Personal Capital knows that we have bond funds in my 401(k) and in my husband's Roth IRA. It knows that we have a REIT fund in my IRA. For my husband's 401(k) with AXA and our accounts at Stockpile and Robinhood, linking is not possible. Since Stockpile and Robinhood sell stocks anyone can purchase at any licensed broker, all we have to update is the number of shares; Personal Capital looks up the price and updates it daily. The funds sold by AXA are not trackable by a ticker symbol so we have to update everything manually. Personal Capital also allows you to enter the value of assets such as real estate, and liabilities, such as mortgages or other loans. If you consider your Beanie Babies to be an asset, you can enter a value for them (I don't think it has a way to automatically value collectibles). Personal Capital also has a Retirement Planner that takes information about my assets, my plans for future spending (like when we plan to buy a new car) and my saving plans, looks at my risk tolerance and estimates whether I will meet my retirement goals. It is a basic Monte Carlo analysis that estimates what is likely to happen in the worst markets and the best and then predicts how likely it is that I will have enough money to meet my goals (90% chance right now). Tracking investments,in my nerdy opinion, is fun, particularly in years like this when the market does well. Tracking expenses, not so much so. However, one of my financial goals next year is to sit down and link my credit card and bank accounts to Personal Capital to track my spending. According to things I've read, Personal Capital will import your spending information and then allow you to slice and dice the data. How much did I really spend at Amazon.com last year? Is my coffee habit really hurting our plans? Where is the low-hanging fruit for spending reduction? Setting up an account with Personal Capital is free, as is linking all your accounts to it. They hope to make money by selling you advisor services. As a matter of fact, right now, setting up an account is better than free: if you use this link to Personal Capital, set up an account and link one of your accounts to it, then both you and I get $20.00. Should you decide to use them as your financial advisor, they are fiduciaries, meaning they are obligated to act in your best interest. For accounts under $1 million, they charge 0.89% per year of assets under management. I have not used Personal Capital as a Financial Advisor, and honestly I doubt I'll ever hire anyone for that job again. However, compared to my experience using an H.D. Vest advisor, at least according to their website, you get a lot more service for a lot less money. Personal Capital claims to take all your assets into consideration when planning your investments, which makes perfect sense. I know over half our assets are in our 401(k) accounts, and the funds in which we can invest are limited. 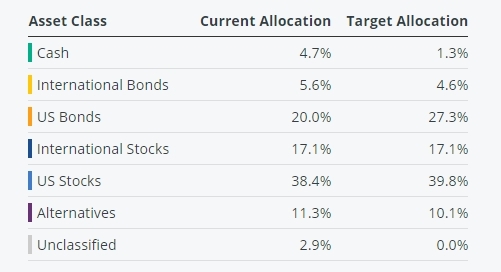 If we want a balanced portfolio, those assets have to be considered. Personal Capital says they offer 401(k) advise as part of their package. Another thing that aggravated me about our financial advisor is that all three accounts we had with him (two IRAs and a taxable account) were invested in the same funds in the same proportions. to me, it made more sense to put funds that paid dividends regularly into tax-deferred accounts, and funds that had price appreciation as a goal in the taxable accounts, since tax would not be due until we sold. Personal Capital claims to tax-optimize your accounts in the way assets are allocated. While you don't get quarterly sit-downs with your advisor, or invitations to sales dinners, you are able to contact an advisor via email or web chat. I have been adding data to my Personal Capital account for the last couple of months and I have found the insights on my investments to be valuable. Why don't you use my link and give it a try, and we'll both get $20 out of the deal. I suppose I should keep you in suspense and make you read to the bottom of the article to find out why I am pulling my money out of Lending Club and Prosper, but I'll break the rules and tell you up front: I am pulling my money out of Lending Club and Prosper because I'm losing money. What Are Prosper and Lending Club? Prosper and Lending Club are "Marketplace Lenders" or "Peer-to-Peer Lenders". They are businesses that use the internet to connect people with money with people who want to borrow money. Unlike banks which risk their own assets, marketplace lenders risk investors money. Prosper and Lending Club make money via origination fees and monthly processing fees. Prosper, in its current form, began in 2009; Lending Club started in 2006, and pretty much took its current form in 2008. Both specialize in unsecured personal loans. What Risks Do Investors Bear with Lending Club and Prosper? As with any debt instrument, investors in Lending Club and Prosper bear the risk of default--they have no guarantee that the loan will be repaid. They also bear a limited amount of interest rate risk--the risk that interest rates will rise in the future, leaving them with an investment that pays less than market rates, which could cause the value of the notes on the secondary market (where those who own Lending Club notes can sell them to others). The credit risk, the risk of default, is what is getting me (and other investors) now. As my brother the car salesman said "I can make money lending money to any group of people, I just have to price it right". In the money lending business, interest rates have to be high enough so that those who do pay cover those who don't. Investors in both Prosper and Lending Club had minimal earnings during the financial meltdown that started in 2008. Defaults were high compared to interest rates and lenders did not earn much. However, as the economy improved, so did earnings. Mr. Money Mustache started investing in Lending Club in September, 2012. Like most investors, his initial returns were very high because it takes time for loans to default. By September, 2015, when the first notes he purchased were fully mature, his return had dropped to 11.99%. A year later, it was 10.18%. By October, 2017, MMM's lifetime returns had dropped to 7.72$ and his experience was similar to mine--his monthly interest was being consumed by defaults. Clearly right now, the pricing on those notes is too low--the people who are paying are not paying enough interest to cover the defaults. Lending Club investors have become victims of the law of supply and demand. Two years ago investors complained that they had too much cash in their accounts--there were not enough notes in which to invest. In order to attract more borrowers, Lending Club lowered interest rates, because they believed investor returns did not have to be that high to attract enough investors. Now they are beginning to raise them again because defaults are too high--and right now, unemployment is low and overall, the economy is doing well. If things take a turn for the worse, these unsecured loans will be some of the first people quit paying. Most of it is going into a diversified portfolio of Vanguard mutual funds. That is a sensible, low-cost investment that has stood the test of time. It may not garner me clicks on my blog, but year in and year out, it gives results. I'm going to play with a little bit of it and buy some individual stocks via Robinhood, a commission-free broker. When it comes to money, hope is not a strategy. Toughen up, take action, and keep what's yours! Have you, like many women, put off organizing your financial life? You know you want independence, you know you want to save, and you know you want a solid retirement. But if you're overwhelmed at the thought of where and how to begin, you're not alone. You may have been raised to defer to others in matters of money, or you may feel you simply lack the understanding of how to take on financial matters. Without the confidence they need, it's easy for women to find themselves in a situation where the only action they feel they can take is hoping that everything will turn out all right in the end. But planning for the future doesn't have to be this way. 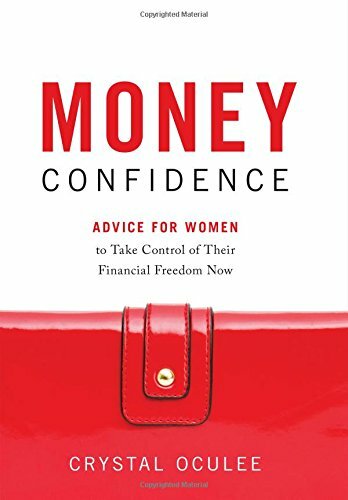 Money Confidence is Crystal Oculee's authoritative and engaging reality check and call to action for women of all ages to take--or regain--control of their financial lives. The author shows why hope is not a financial strategy, and how, with the tools and information she provides, women can attain the independence, savings, and secure retirement they want. The author cleverly employs metaphors from familiar fairy tales to illuminate and accentuate the book's serious message: Women need to toughen up; and they can and need to identify and overcome myths and mind-sets that place them at a disadvantage when it comes to dealing with their money and finding and working with financial advisers. Oculee shows women how to communicate, be strong, ask questions, and reject advisers who don't take them seriously. Real-life scenarios of various women's experiences with money and advisers prove how women can get the confidence they need once they know what is holding them back. The author presents informative, down-to-earth explanations of common financial situations and specific financial products along with useful worksheets in a conversational and friendly tone with a good dose of sass. Women will find her valuable and easy-to-follow advice rings true. Ever read a book you thought was good, but to which you had a hard time relating? In Money Confidence Crystal Oculee uses fairy tales to illustrate how women allow others to control the most important thing in their lives--their money. Many are waiting for Prince Charming to rescue them rather than taking things into their own hands and making things go their way. Investments and the stock market have always fascinated me and I've generally handled the investments at my house, or at least been a well-informed partner when my husband handled them. On the other hand, my intelligent competent mother never fooled with any of that. She didn't have to ask Dad for money--the checkbook was in her purse to use as desired, but she didn't do the taxes or make the investment decisions. Before it became apparent that my mother was going to be the first to die, my dad showed me where all the investment information was and told me that we were going to have to take care of Mom after he was gone (and of course Mom's last words to me were to take care of my dad). In any case this book reminds us that financial advisers are rarely Prince Charming, and that if one is doing something you don't understand and won't answer your questions, he probably isn't working in your best interest. Oculee suggests that you CAN do it yourself and as one who has fired a financial planner who made more from my account that I did, I agree. Another thing she points out is that while men are generally able to compartmentalize relationships and treat business and professional relationships as straightforward barters, women tend to get emotional. While, in general, men don't feel bad about firing someone who isn't performing, women do. We tend to be more concerned that the needs of others are being met than our own (yup, that's me too), and will make excuses for those who don't perform. Another chapter discussed 401(k)s and the mistakes people make with them--both men and women. Unlike the old-fashioned pension that was handled by professionals, individuals need to be aware of the investments in their 401(k)s, the amounts of their contributions and what to do when they leave a job. Oculee works as a financial advisor and she gives tips on how to hire one--the most important being to decide what you want, at least in my opinion. I think that was part of the problem we had with ours--we wanted advice about things that weren't his strengths and didn't need what he was selling. Finally Oculee spends some time talking about risk and then looking at the major investment choices. A completely revised and updated edition of an investing classic to help readers make sense of investing today, full of “solid information and advice for individual investors” (The Washington Post). Today, anyone can be an informed investor, and once you learn to tune out the hype and focus on meaningful factors, you can beat the Street. 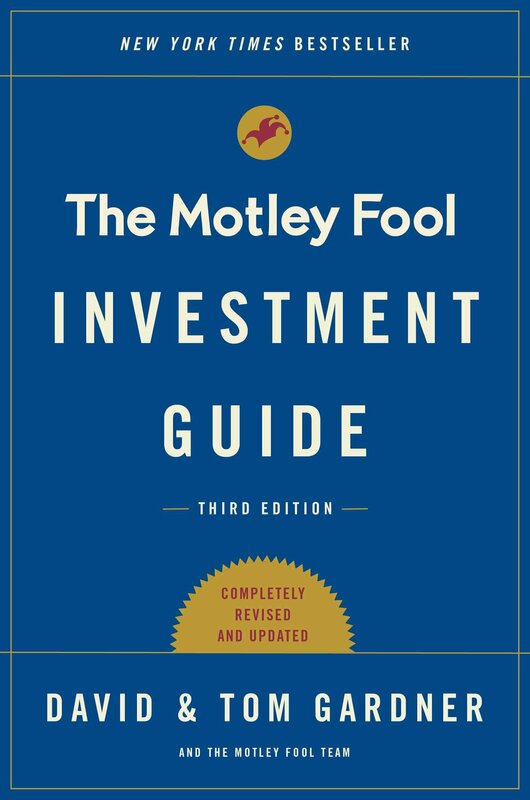 The Motley Fool Investment Guide, completely revised and updated with clear and witty explanations, deciphers all the current information—from evaluating individual stocks to creating a diverse investment portfolio. The Motley Fool rose to fame in the 1990s, based on its early recommendations of stocks such as Amazon.com, PayPal, eBay, and Starbucks. Now this revised edition is tailored to help investors tackle today’s market. “If you’ve been looking for a basic book on investing in the stock market, this is it...The Gardners help empower the amateur investor with tools and strategies to beat the pros” (Chicago Tribune). Conventional wisdom right now is that the best investment strategy for the average person is to invest in a diversified portfolio of low cost index mutual funds or ETFs. Studies show that few professional money managers are able to consistently beat the averages so just buying those averages puts you ahead of them. Rather than espousing conventional wisdom, The Motley Fool Investment Guide says that you can be better than average by investing in individual stocks as opposed to mutual funds/ETFs. Their basic thesis is that fund managers are playing with too much money so that when they buy into a company it affects the price of the stock; and the same when they sell. It is the opinion of the authors that individual investors, even if they do not possess the expertise that some of the professionals do, are able to achieve better than average results if they gather the proper information, analyze it and purchase stocks that are likely to produce better than average gains. The book is easy to read and it describes where to get information on public companies, how to interpret it and what qualities to seek. While The Motley Fool Investment Guide gives a lot of good information, it is also a not-so-subtle sales pitch for the premium services offered via Motley Fool's website. Those services start at $99 per year. Still unlike some other books that seeks subscribers for websites, The Motley Fool Investment Guide tells you how to do it yourself--if you have the time, knowledge and resources. It makes outsourcing the job sound very attractive. Still if you want to learn how to pick stocks, The Motley Fool Investment Guide is a good start. 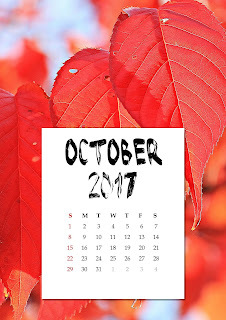 As the calendar flips yet another page, I realize that the race to retirment is more than just a blog title. Time is passing, people are dying, and I'm getting older. All the more reason to save for the future and to think about the time in my life when I won't get up in the morning and head for the office. As anyone who has any amount of money in the stock market knows, this has been a very good year. It makes up for a few stinkers we've had lately. Let's take a look at how things are going financially at my house. We are still paying down a substantial medical bill in incurred this spring/summer. The hosptial doesn't charge interest and the reminder notes it sends aren't mean. They get a few hundred a month, and if not happy, at least they are not bugging me for more. My college graduate is still looking for a fulltime job but her mean mom has started to make her pay rent and for her phone and Netflix, so its a little less outgo here. At this point we own her car and it is on our insurance, which is due this month. I showed her the bill, explained what it meant and told her that we were paying it, this time. Next time it is hers. She can decide whether to transfer the car to her name (and pay the sales tax) and get her own policy or she can keep it on our policy. She can raise the deductibles, but the car is hers to fix if wrecked. As long as it is in our name, she has to carry our high liability limits; if she transfers it, she can lower them. On the other hand, there are discounts on our policy that she wouldn't be able to get on her own. Oh well, as a recent college student she ought to have research skills. She can decide what to do and I'll be glad to be rid of that bill. My husband and I have Roth IRAs and regular IRAs, and a taxable account. We deposited $1100 in each Roth IRA this quarter. The combined dividends from these accounts totalled $1751.93. These accounts consist of a variety of mutual funds purchased for us by our ex-financial advisor, along with Vanguard's International Bond Index Fund, Total Stock Market Index Fund, 500 Index Fund, Total Bond Market Index Fund and REIT Index Fund. In the last year, our rate of return has been 11.5%. My 401k has a year to date return of 16.46 %, and the account paid dividends of $531.60 this quarter. It is invested in Janus Triton, Oppenheimer Int'L Small Mid Co A, MFS Government Securities Fund-A , Pioneer Fundamental Growth Fd-A, and Delaware US Growth Fund-A. My firm contributes 5% of my salary, and I contribute 6%. The initial investment in this account was $7,000. It began the quarter at $8355.99 and ended the quarter at $8,850.43, This quarter the account has paid $33.46 in dividends. I have invested in "Motifs" or baskets of stock with a variety of themes including dividend payers, things I like and online gaming. I had been withdrawing my dividend payments and investing them via a no-commission broker, but Motif has changed their fee policy such that if you have less than $10,000 and do not have any commissions in a given six month period, they charge you a $10 fee. To avoid that, I have started accumulating my dividend payments and last week I purchased another Motif--this one contains shares of a variety of REITs. My plan is to contribute to the account until it reaches $10,000. The market is helping. "5.05% annually, whereas three months ago it was 5.68% annually". As my notes mature I'm moving the money elsewhere. The economy on the whole is fine now; if I can't make money with Lending Club under this economy, I'm going to lose it big time if things go downhill. The profits today do not justify the risk. My returns here have dropped as well. Three months ago my annualized net returns were 6.9%, and my "seasoned" returns--the returns on notes that are more than ten months old were 6.23%. Those figures have dropped to 5.41% and 4.82%. Time to shut off the auto reinvest here as well. At the beginning of the quarter I owned shares of AT&T, Visa, CVS, Lending Club and Hanesbrands. During the quarter I bought Hormel. Robinhood is an online broker that uses phone apps only, no webpage. They charge no commission and allow you to place limit or market orders. They also allow you to initiate bank transfers and then invest the money immediately--you do not have to wait for the tranfer to complete. You do have to buy whole shares. I've added money to this account that I've withdrawn from Kickfurther and right now the value is $442.96. So far this year, dividends from this account total $2.24. This is an online broker for whom I wrote a sponsored post. I invested $100 in Johnson & Johnson through them. They charge $0.99 per trade, so even though they sell fractional shares, I don't recommend investing less than $100.00 per trade. I plan to keep the account and use it when I want to buy shares of stock that are substantially over $100, since my investments in individual stocks are as much toys as investments and I don't plan to put too many dollars in any one stock. Stockpile had a promotion this quarter where they were giving away $5.00 worth of Apple stock so I got mine. At the end of September this account was worth $104.06. I'm in the process of withdrawing my money not only because I'm in the red (an expected risk of investing) but because I've become convinced that Kickfurther is going to fail. They have too little business at this time and while they have tightened their contracts and changed their business model somewhat, I've just seen too much incompetence to believe that the investment risk is the only risk I'm bearing and the returns have not justified the risk. All in all, the third quarter of 2017 was a good one investment wise. As compared to the beginning of the year, we are about almost a year's pay richer, but most of that is stock market gains, not savings. We did not have to pull any money out of our savings this quarter, but we haven't been able to replace any we withdrew earlier this year. However, the big bills for the year have been paid; the next big irregular bill will be the car insurance six months from now and we are saving for it and the other big irregular bills. How did the third quarter go for you? Which Type of IRA Should I Choose? 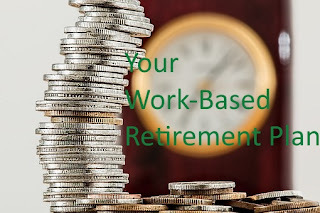 While many people have a work-based retirement plan of one sort or another, that plan may not be all you need to prepare for retirement. Today we are going to take a look at Individual Retirement Accounts--accounts that you fund but which the government helps you with by deferring or foregoing taxes. When you leave an employer that has a 401(k) or similar plan, you are offered the opportunity to roll the money from the employer plan into an IRA. The transfer has to take place between the custodians (companies holding the money) but a rollover puts you in charge of the investments and often allows less expensive options that what the employer may offer. Money is a rollover IRA remains there until withdrawn. If you withdraw it before age 59.5, you have to pay penalties as well as taxes. IRAs are accounts individuals open with banks or brokerage houses and to which pre-tax dollars are contributed. When you do your taxes, the amount you contribute to your IRA is deducted from the amount of money on which you owe taxes. As of 2017, individuals under 50 are allowed to contribute $5,500 to an IRA yearly; those over 50 are allowed to contribute $6,500 annually. In order to contribute to an IRA, you must have at least as much earned (as opposed to investment) income as you contribute, or be the spouse of an earner. IRAs may be invested in mutual funds, stock, bonds, or just about any other type of investment except individually-owned real estate. You get to decide where to open the account and in what to invest. You may choose to have one IRA or multiple ones (but the contribution limit is per person, not per account). Once money is put in an IRA, withdrawing it before age 59.5 means penalties on top of the taxes owed. There are a few exceptions, such as the purchase of a home, payments of medical expenses and payments for college, but in general you should consider money in your IRA to be for retirement, not for the new car or other pre-retirement expenses. Like the 401(k), earnings within the IRA accrue tax-deferred. If money is withdrawn after age 59.5, that money will be taxed at your then current tax rate. Also like the 401(k), you are required to take a minimum distribution each year after you are 70.5. If there is still money in your IRA when you die, it is distributed to the named beneficiaries (not through your will), and as is true with distributions from a 401(k) they will owe taxes on the money unless steps are taken to defer them. The Roth IRA is a relatively new type of account. In order to contribute to a Roth IRA, single people must have a modified adjusted gross income below $133,000, but contributions are reduced starting at $118,000. If you are married, your MAGI must be less than $196,000, with reductions beginning at $186,000. You must also have earned income (as opposed to investment income) of at least the amount of your contribution. While regular IRAs allow you to defer the taxes you pay on both the money you place in the account and the money earned via the account, contributions to the Roth IRA are taxed before they are deposited. However, the money earned on the account is NEVER subject to income tax. Another advantage of the Roth IRA is that you can withdraw your contributions penalty-free at any time, and since you have already paid taxes on them, they will not add to your income that year. This makes the Roth IRA a good place for young people who aren't sure what the future will bring to save money. While you don't want to have to take money out of your Roth IRA, the money is accessible if you are laid off, or even if you need a new car. While regular IRAs require that those 70.5 and older take minimum required distributions, Roth IRAs do not. If you do not need the money that is in your Roth IRA, you can leave it there to continue to grow. When you die, any money left in a Roth IRA passes to the beneficiary(ies), and those beneficiaries do not have to pay taxes on that money. As noted above, the main advantages of the Roth IRA are that you never pay taxes on earnings and you are able to leave the account to beneficiaries without subjecting them to income taxes on the money. However, as also noted above, if you make too much money you cannot contribute directly to a Roth IRA. But, there is a "back door". The law allows owners of regular IRAs to convert those IRAs to Roth IRAs. If you choose to do so, taxes become due that year on the converted portion. So, if you convert a $10,000 IRA to a Roth IRA, your taxable income that year increases by $10,000, giving you an additional tax bill of $2,100 if you are in the 21% tax bracket. There are quite a few calculators online that will tell you whether it is likely to be advantageous to you to convert your current regular IRA to a Roth IRA (and it can be done a little at a time, you don't have to move the whole account in one year). Basically you have to consider how long you have until you are likely to need the money, what your tax bracket is now, and what it will likely be in the future and whether you have cash available with which to pay the taxes. Those who do not qualify to put money into a Roth IRA directly are allowed to convert a regular IRA into a Roth IRA. The advantage of a regular IRA is immediate tax relief. Tax brackets this year for those with taxable income over $91,000 range from 28% to 39.6%. In those cases, a regular IRA allows you to invest 1/3 more money than a Roth IRA does. If you are in peak earning years and expect your tax bracket to decrease significantly after retirement, the regular IRA may be your best bet, particularly if you plan to withdraw (and spend) the money. While the Roth IRA does not give you immediate tax relief, you never owe taxes on the money from the account and you never have to take money out of it. If you expect your tax bracket later in life to be similar to or higher than your current bracket, the Roth becomes more attractive. The main thing to remember about either IRA is that it doesn't make money unless you put money in it, there won't be any money to take out. Unless you work for the governement or a non-profit, you are unlikely to have this available to you. These are traditional pensions where employers contribute on behalf of employees and guarantee to pay a specific benefit for the life of the employee, based on a number of factors, including the number of years employed, the average salary and the final salary. The main advantage of these pensions is that the employer takes the risk. Contributions from employees may be required, and if so, the amount is not optional. However, at the end of the day, you will know what you will receive and some of these pensions, particularly for school teachers or military personnel, can be very generous compared to the size of the paycheck. The main disadvantage of these pensions is that they are not portable. If you swich employers, voluntarily or not, you may lose benefits. They may give you some money upon leaving a job, but it it is probably not worth as much as the pension would be. For example, I taught in Louisiana public schools for two years, and money for teacher's retirement was deducted from my check. When I left, they refunded my contributions, but not those of the school system, and I received no interest. If you participate in such a plan, you need to know the vesting schedule. At what point will you be eligible for payments, and how much will you get? The last thing you want to do is to leave a job a year or two before you would become eligible for a pension. Most pensions have some provision for continuing benefits to a spouse after your death in return for smaller payments during your life. However, once you (and your spouse if that option is chosen) die, the pension is no longer an asset and cannot be left to your heirs. Some pensions will allow a lump-sum distribution when you retire, which give you the ability to leave left-over money to heirs, but it comes at the cost of a guaranteed check for the rest of your life. Generally speaking pension income is taxable income in the year it is received. Some places that offer defined benefit plans also offer defined contribution plans which are a boon to those who do not plan long-term employment with that employer. To get the most from a defined contribution plan, consider the vesting schedule carefully in making decisions about continued employment, so that you do not leave right before additonal benefits would be due to you. In picking your pension payout, consider other assets available and the age of your spouse to pick the type of payout that will likely be worth the most in your situation. These are the 401(k), 403(b) and similar accounts. Instead of guaranteeing how much money you will receive when you retire, employers who use these plans define how much they will contribute on your behalf (and sometimes that contributioin is $0). Employers often "encourage" employees to contribute by making employer contributions "matches" rather than outright grants. Employee contributions to these plans are made on a tax-deferred basis, which means you pay income taxes on the money when you take it out of the account, rather than when you put it in. If you are in the 15% tax bracket that means that $100 contributed to the plan reduces your paycheck by $85. As long as money stays inside the plan, no taxes are assessed on earnings. Employers usually contract with an investment company to run the plan. Usually employees are offered a variety of investment choices--usually mutual funds or similar--and the employee has to decide how to invest his or her account. If an employer offers to match employee contributions, employees should do their best to contribute enough to get the maximum match--after all a guaranteed doubling of your money the first year is impossible to find in any other investment. As far as how much an employee should contribute to an employer plan once a maximum match has been achieved, that depends on the quality of the offered choices and the expenses related to the plan. My husband's plan has only high-expense funds with mediocre returns. We get his match and don't add more to that account. My office plan is pretty good so we make substantial contributions. Some companies allow you to borrow from your 401(k), others (like mine) do not. The only way we could access the considerable money in that account (I've been there over twenty years) is for me to quit. If I quit and wanted to spend that money before I was 59.5 years old, not only would I have to pay taxes on that money at my then-current rate, I would have to pay a penalty. When employees leave a job with a defined contribution plan, they can always take their contributions with them. Federal law requires that employees who have been at a job at least three years be allowed to take some of the employer contributions with them (partial vesting) and that those who have been there at least five years be allowed to take all of the employer contributions with them (full vesting). Often employees who leave are offered to option of maintaining their accounts in the employer program or of moving them to an IRA. While employer programs are a little more protected from creditors than IRAs, IRAs give you a wider range of investment options, and often lower fees. Having all your accounts in one place can also simplifiy monitoring and bookkeeping. Employees who leave a company are also offered the opportunity to "cash out" their retirement accounts. For employees who are under 59.5, this means paying a penalty on top of taxes, and if your distribution is substantial, it could push you into a higher tax bracket, thereby costing you even more in taxes. Unless there is an urgent need for the money, this option is not recommended for anyone. When you retire and withdraw money from your plan, it is taxed as ordinary income, since no taxes were paid when the money went in. It makes no difference whether the money you withdraw was money you contributed, money your employer contributed or money that has been earned inside the account. Generally speaking, once you reach 70.5 you are required to take a minimum required distribution from your 401k, and that amount is based on what actuarial tables say is necessary to deplete the account by the time of your expected death. If you die with money in a 401(k), it is distributed to the beneficiary (ies) you named, and is generally taxable at that time unless steps are taken to defer the taxes. The steps aren't difficult, and hopefully the custodian will inform you about them, but they would require another whole blog post, so maybe next week. To get the most out of your 401(k), contribute enough to get the maximum match. Pay attention to vesting schedules so you do not leave shortly before you would be entitled to more money. Keep an eye on the investment options and fees to determine whether the plan is a good place for discretionary contributions. Work-based programs form the backbone of most people's retirement. Know how to get the most from yours.